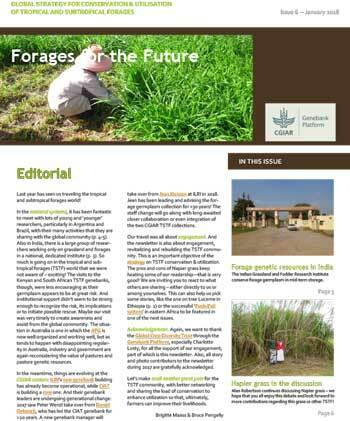 Forages for the Future newsletter #6 covers a wide range of countries and situations for forage R&D. The issue draws on recent visits to national institutions with emphasis on conservation and utilization of tropical and subtropical forage genetic resources in Australia, South Africa, Kenya, India, Argentina and Brazil. Continued debate on Napier grass and its alternatives (Alan Robertson). The newsletter, “Forages for the Future”, launched in June 2016, is a first result of a meeting of experts in October 2015 in Bonn, Germany, to discuss a Global Strategy for the Conservation and Utilization of Tropical and Subtropical Forage Genetic Resources. The newsletter is published under the auspices of the CGIAR Genebank Platform. Its editors are Bruce Pengelly and Brigitte Maass, consultants of the Crop Trust. All past issues can be found by visiting the Tropical Grasslands-Forrajes Tropicales online journal. To share your forage stories with the global community and/or receive upcoming issues directly to your inbox, please contact Brigitte Maass (Brigitte.Maass@yahoo.com) and Bruce Pengelly (Bruce.Pengelly@gmail.com).